In a stressful state, you cannot come up with a right solution or cannot deal with any task. Stress can also push you over the edge. Stress or tension affects your body parts like the neck, head, and shoulders. If you are looking for an external option to relieve stress and reduce pressure in the mind and the body, then yoga is your best solution. It is possible to make you more flexible with those stress trigger pop up. This pose stretches hamstring, hips, and thighs so that it can relieve mild depression, fatigue, and stress. It helps to calm your busy mind, relaxes the nervous system, and enhance the feelings of peace and calm. Actively, it aids in balancing the sacral chakra when it is over stimulated. This pose also helps in controlling the excessive and fluctuating emotional energy. Stand straight in a comfortable posture, and bend forward so that your palms should be brought flat with the head pressed against your legs. While doing this, you will feel the spine stretch in the opposite direction, then push your hips up and straighten your legs to stretch deeper. Hold on for 5 to 6 minutes then bend your knees and bring arms to the side and raise arms and torse back to standing. Good for glaucoma, and high blood pressure. Child Posture is one of the best poses for soothing the adrenals and practicing this posture every day can make you stay calm and composed. Sit in a comfortable posture with bones back over your heels and hands out before you. Now slowly bend your torso front until the center of your eyebrow rests on the mat. Now keep your knees together, or you can separate your knees so that it is wider than your hips. Arms should be resting back along with your body, and palms should be up. To feel more comfortable you can stack your forearms and hands to rest your head. Hold on in this posture for 10 minutes and practice deep breathing exercise. Lie flat on your back and stretch your legs and keep it together, but it shouldn’t touch each other. Keep your palms up and arms at sides. Now, close your eyes and relax Hold on in this position for 5 – 6 minutes and take deep breaths. While you take deep breaths, focus on each part of your body starting from head to toe. This yoga pose can help you to relax your body parts by opening through the inner thighs, hips, and groin because these are the parts which hold stress and tension. 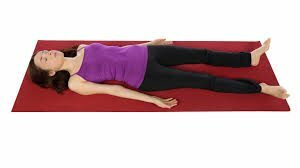 Lie down on your back and keep your knees at the side and take the feet soles together. If your knees are far from the mat, you can also use bolsters, yoga blocks, or folded blankets below the knees to make the posture more soothing. Hold on at this posture for few minutes or until you feel comfortable. Thunderbolt pose benefits you in several ways. It has an excellent soothing effect on the body and mind. If you are under pressure or in work-life stress, practice this posture for few minutes every day, this will help you in releasing the stress and tension. Sit back on your heels and place a cushion or soft pillow between the sit-bones to feel more comfortable. Cross your hands in front of the chest and cup your palms under the arms such you’re your thumbs point out in front. Hold on in this pose for a few minutes, take deep breaths and exhale as long as you can. You will be able to feel your mind and body are completely relaxed.